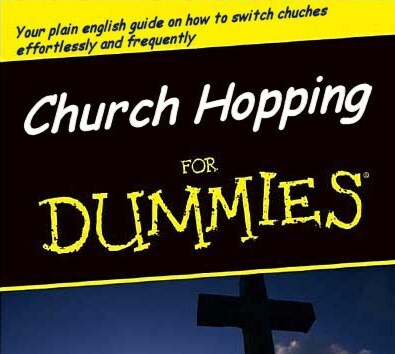 ARE YOR A CHURCH HOPPER? The modern day church has succumbed to a matrix of religions. Clichés such as "Backdoor Saints" or Church Hoppers". And these traits seem to be gaining religious ground, in today's society. Sad to say, however, this metaphorical phenomenon, seems to be sweeping the country. Why is this? Often times, when I feel like relaxing without falling asleep, I will give the old TV remote a work out. I'll just keep flicking the various TV channels, until I find a subject that fits my fancy. Is this not like our modern day Christians. If they don't find their needs being met in a particular church, they will just move on to greener pastures. Thus, a "back door saint", or a "church hopper", if you please. I know a nice Christian couple, with whom we are friends. And seemingly every time we meet, they have changed churches. What's so strange, is that they stay in the same main line denomination. From a hypothetical secular viewpoint, suppose we added reasons for leaving the church as poor leadership, not liking the style of worship, not enjoying a specific music format, dealing with the bureaucracy, having deep inner hurts, the church size, an unfriendly atmosphere, talents not being used, not having epidural needs met, etc. I'm sure you could add to this listing, as well. It would be very interesting to see how many AWOL Christians exit the church strictly because their spiritual needs are not being met. (Psalm 92:12-13) Speaking on behalf of the Holy Spirit, Paul has given us the point to ponder, of having unity within the church. (1 Cor 12:12-21). Do we run to greet our fellow church members, during the "meet and greet" segment of the Sunday service, only to forget them during the week? Do we ask how they are doing on Sunday, then forget to call them during the week? This is what I call "Sunday Friends". You may be a new attendee or have been in church a half century. You may have attended every denomination know to man. You may have been in churches where the preacher spoke in dulcet tones or in others where he'd speak in tongues. You may have been where the congregation remains quietly in pews or where they jump in the aisles. You may have been where they would raise their hands in praise and others where they kept their hands on their wallet. close this "back door"? Dr. Luke, speaking again on behalf of the Holy Spirit, gave us the best example. (Acts 2:41-47) If only our churches would build their "Church Constitution and By-Laws" around this first church doctrine. I am very concerned about today's church. Everywhere I look the church worship services are being distorted or are being watered down. False teachings and vague unscriptural doctrines have infiltrated our churches so much so they have divided the body of Christ. Many Christians that have fallen for these lies and were misled are now leaving the church confused, discouraged, and betrayed not knowing who or what to believe anymore (1 John 4:1-6). My old preacher Daddy, who is now at home with the Lord had a famous saying, "I don't care how high you jump, just so you walk straight when you hit the ground."